This post is by Jill Croft, Medical Scientist, Tonga. Jill Croft here – the medical scientist on this trip. What exactly does that mean you ask? Well I look after all the blood testing for the patients and make sure that everything blood related is in order. Calibrate / Run Controls on our Blood Gas Analyser. Run down to the Lab and bring up the donated blood for the patients. The systems in place for blood management are a bit primitive so I’ve been talking with the lab about ways they can potentially improve their service. 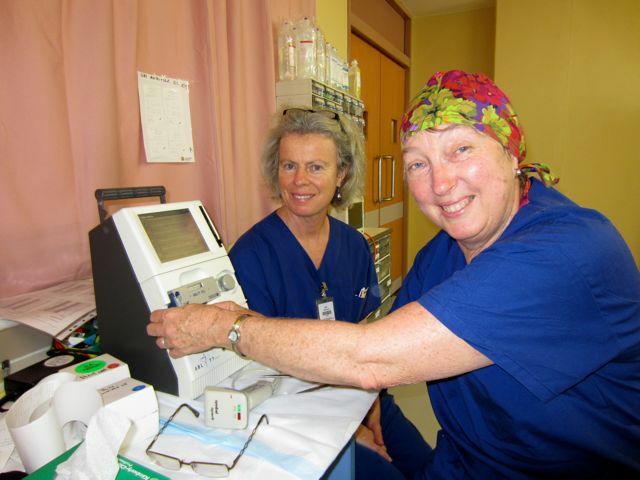 Run blood gas tests for theatre patients – pop in and out of theatre. Run down to the lab to check haemoglobin and haemotocrit on gas samples for patient have open heart surgery. This keeps the perfusion guys happy as the results are more reliable. Check the surgical lists for the next couple of days and inform the lab when blood will be required. There is not really a blood bank here in Tonga, so patients have to “BYO”!! This means the patient relatives come along to give blood usually the day before surgery, but sometimes even the same day! And then if there is any spare time I go and make a nuisance of myself in Intensive Care and run some more blood tests on the patients to make sure they are all happy and healthy after surgery! The systems are a bit antiquated to what I am used to back home, but we make it work. Well thats me done – I better get a wriggle on and get some test results to theatre.